Objective: With sporadic reporting of BPs related osteonecrosis of jaw and in absence of definitive guidelines regarding the management of such patients, the dentists and the oral and maxillofacial surgeons need to be updated about this issue. The objective of this article was to produce an updated bibliographic review of BPs related ONJ. This paper reviews the literature regarding the same for better understanding of the problem and its management. Background: Bisphosphonates (BPs) are potent inhibitors of bone resorption and are widely used in the treatment of osteoporosis and other diseases that cause bone mass loss, such as Paget's disease, bone metastases, and multiple myeloma, to prevent pathological fractures. With increasing use, evidence is emerging that patients taking BP drugs are at risk of developing osteonecrosis of the jaws (ONJs), sometimes occurring spontaneously, but more commonly following dental extractions or oral bone surgery. Materials and Methods: A bibliographic search was carried out using PubMed, Medline, and search engines ending in April, 2013. The search terms used were: Oral BPs, dental implants, and osteonecrosis. Conclusion: On the basis of available literature, the management of patients on bisphosphonates requiring dental treatment is classified according to the duration of BPs treatment, method of administration of BPs etc. Dental treatments when planned carefully in such patients have a fair to good prognosis. Introduction : Importance of soft tissue consideration in establishing treatment goals for orthodontics and orthognathic surgery has been recognized and various cephalometric analysis incorporating soft tissue parameters have evolved. The great variance in soft tissue drape of the human face and perception of esthetics exists and normative data based on one population group cannot be applied to all. The study was conducted to compare the standard soft tissue cephalometric analysis (STCA) norms with norms derived for population of western Uttar Pradesh region of India. 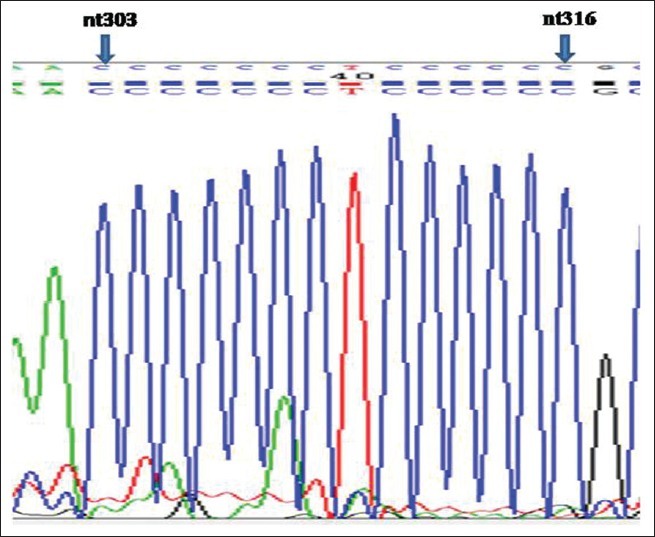 Materials and Methods: The sample consisted of lateral cephalograms taken in natural head position of 33 normal subjects (16 males, 17 females). The cephalograms were analyzed with soft tissue cephalometric analysis for orthodontic diagnosis and treatment planning, and the Student's t test was used to compare the difference in means between study population and standard STCA norms. Results: Compared with established STCA norms, females in our study had steeper maxillary occlusal plane, more proclined mandibular incisors, and less protrusive lips. Both males and females showed an overall decrease in facial lengths, less prominent midface and mandibular structures and more convex profile compared with established norms for the White population. Conclusions: Statistically significant differences were found in certain key parameters of STCA for western Uttar Pradesh population when compared with established norms. Aims: The present study was undertaken to evaluate the efficacy of biodegradable plating system for fixation of maxillofacial fractures and to study the morbidity associated with the use of biodegradable plates and screws. Materials and Methods: This prospective study consisted of 10 patients with maxillofacial fractures requiring open reduction and internal fixation. 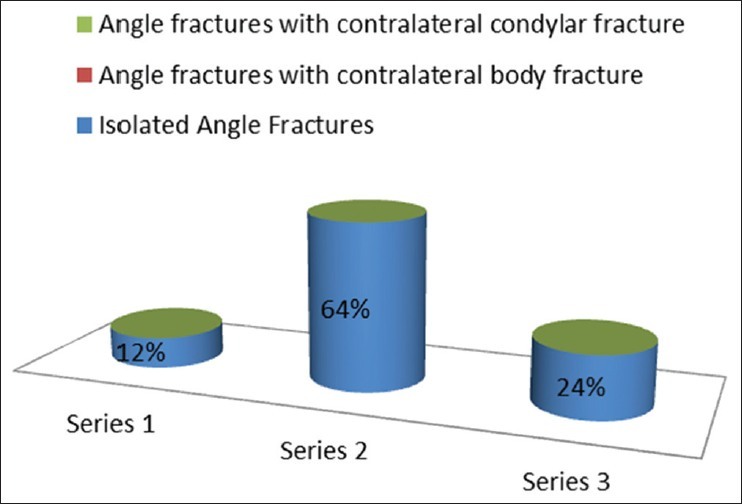 Fractures with infection, comminuted and pathological fractures were excluded. All were plated with biodegradable system (Inion CPS) using standard plating principles and observed for a total period of 24 weeks. Characteristics of the fractures, ease of use of bioresorbable plate/screw system and post operative complications were assessed. Results: Of total 10 patients, eight patients were of midface fracture and two pediatric patients with mandibular fracture, with nine male and one female. The mean age was 32.8 years. Out of 20 plates and 68 screws applied to the 10 fractures sites; there were three incidences of screw breakage with no other intraoperative difficulties. Paresthesia of the infraorbital nerve was present in two patients, and recovered completely in four weeks after surgery. Fracture reduction was considered to be satisfactory in all cases. One patient developed postsurgical infection and was managed with oral antibiotics and analgesics. Conclusions: Favorable healing can be observed through the use of biodegradable plates and screws to stabilize selected midface fractures in patients of all ages, as well as mandible fractures in early childhood, however further studies with more sample size are required. Purpose: The aim of the present study was to assess the utility of anterolateral wall of maxilla as a bone graft to reconstruct the continuity of orbital floor. 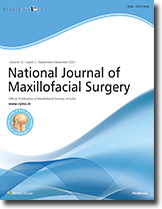 Materials and Methods : This study was carried out at Datarkar Institute of Maxillofacial Surgery, Pratap Nagar, Nagpur. Out of five patients selected, three were male and two were female. All the patients had intact anterolateral wall of maxilla on contralateral side. In all the patients the reduction of the zygomatic complex fracture was done by Keen's approach. The fractures were stabilized by miniplates. From the contralateral sides,bone graft of 1.5 × 2 cm size was harvested from which were intact in all the patients. All the patients were reviewed at regular interval, initially once every week for 1 month, followed by once in every month for next 6 months postoperatively. Results: Five patients with orbital floor defects of medium size average 1.16 cm size (range 0.8-1.5 cm) were grafted by using autogenous bone graft harvested from anterolateral wall of maxilla. All the patients were successfully reconstructed with restoration of the orbital wall continuity. We have not come across any complications like infection, exposure, and extrusion of the graft. Only one patient did not show much improvement in enopthalmous where the size of the defect was large. Conclusions: The use of harvested bone graft from the anterolateral wall of the maxilla is better option for the reconstruction of orbital floor defects. 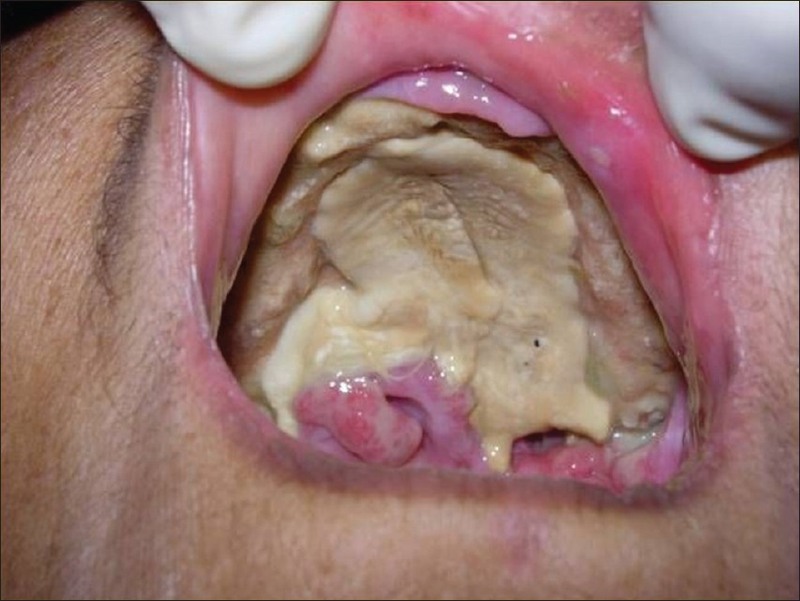 Aims: This cross-sectional study was conducted to correlate the clinical picture, causative factors of leukoplakia with its histopathology in the patients of Garhwal hill region. 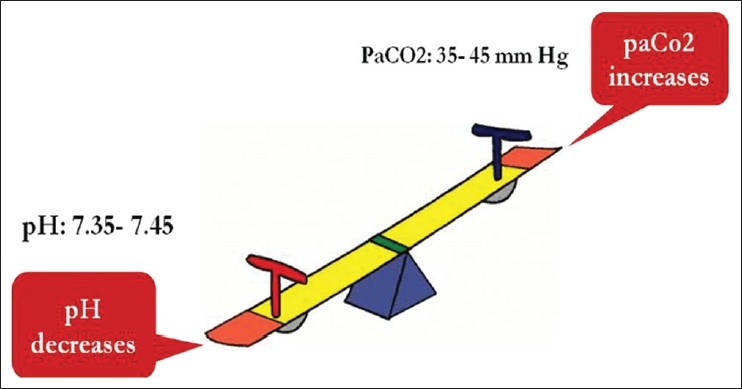 Materials and Methods: The study was carried out on indoor and outdoor patients of Department of Otorhinolaryngology, HNB Base Hospital, Srinagar, Garhwal, Uttarakhand. Patients were interviewed by a predesigned questionnaire and clinically examined. Finally, histopathological examination was done by using proper technique. Statistical Analysis: The data were analyzed by using SPSS version 15. Results: The sample consisted of 90 patients were evaluated. Minimum age of presentation was 18 years while the maximum was 65 years. The majority of patients were in age group of 31-40 years, with male predominance. Majority of cases were of minimum dysplasia and minimum of carcinoma in situ (CIS). Buccal mucosa is the most common site for leukoplakia, while hard palate is the least common site. One case of CIS was reported in buccal mucosa, while two cases of CIS were found in specialized mucosa. Smoking and pan masala (in both types with or without tobacco mixed) had a direct relation with the histological type of leukoplakia, as the amount and duration of consumption increased, the severity of dysplasia increased. Conclusions: Majority of cases were males in age group of 31-40 years. Probably, it was due to the addiction to smoking and pan masala started early in this region. Severity of dysplasia was related to the amount and duration of exposure to smoking and pan masala. Buccal mucosa was commonly involved because of general human tendency of keeping pan masala in buccal region for a long duration. Background: The malar bone represents a strong bone on fragile support and its processes - frontal, orbital, maxillary and zygomatic are frequently the site of fracture. Current study was done to compare the stability of zygomatic complex fracture using Biodegradable plates and titanium miniplates with one point fixation. Materials and Methods: Twenty patients of zygomatic complex fracture were randomly selected and divided in two groups which were further divided into two subgroups (A, B). Group I patients were treated with titanium miniplate at zygomatic buttress and Group II was treated by bio-resorbable plates. One point fixation was done either at zygomatic buttress or at frontozygomatic suture and it was observed that both the site have been the most favored site of rigid internal fixation in terms of stability, aesthetics and prevention of rotation of the fracture segment in either vertical or horizontal axis. Conclusion: There is no significant difference in post operative outcomes between two groups, but still bioresorbable system has some advantage over titanium system as these plates resorbs over a period of time and does not cause any interference with growth and post operative radiotherapy. However application of biodegradable system demands highly précised technique. Introduction: Arthrocentesis is a method of irrigating the temporomandibular joint (TMJ) with a therapeutic substance. It is usually performed by dual puncture with two needles to the joint space. Several studies have shown that arthrocentesis of the upper compartment of the TMJ may be a highly effective method to restore normal maximal mouth opening and functioning. Nonetheless, the classical two needle technique has some limitations, such as the low tolerability and difficulty in performing it in the presence of intra-articular adherences. 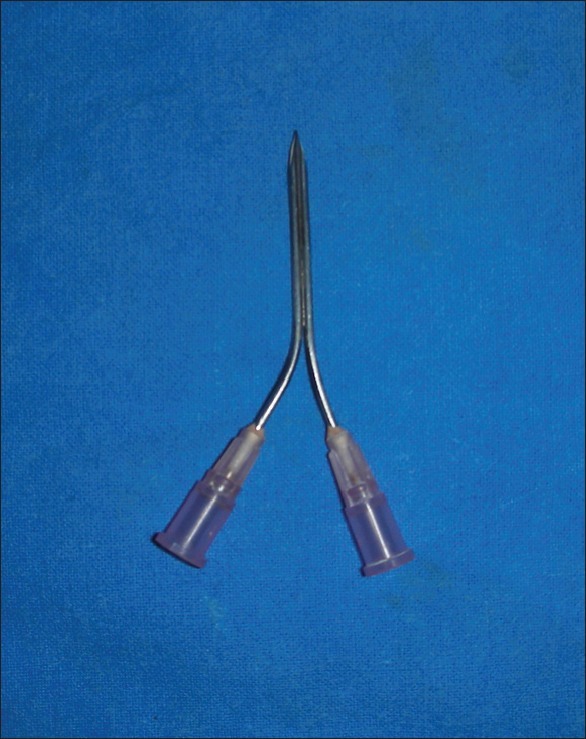 The adoption of a single puncture technique for both fluid injection and aspiration might have some advantages with respect to the traditional two needle approach in terms of time of execution, tolerability, and retention of medication. Materials and Methods: A single puncture technique with a self fabricated device is used to assess the efficacy of this device. This study involved 20 patients of age ranging between 20- 64 years diagnosed with TMD. Patients follow up done at 3 rd , 14 th , 45 th and 90 th day and assessment of pain, mouth opening, clicking and deviation done with comparison of pre and post-operative data. Results: The procedure was successful in all the patients. Most of the patients reported reduction in pain more than half of the previous value and two patients reported only moderate reduction. There was a clinically significant improvement in mouth opening, clicking and deviation. Conclusion: Arthrocentesis is effective in treating TMJ internal derangement and restoring its function. Single puncture arthrocentesis, is a minimally invasive, simple, inexpensive & highly efficient procedure that can be performed under local anaesthesia. Introduction: Oral cancer is the sixth most common malignancy in the world, and the third most common in southeast Asia. Cancers of the upper gingivo-buccal complex are uncommon and reported infrequently. In this article, we have assessed the clinicopathological features of such cancers and their optimal management. Materials and Methods: We studied 64 patients with cancer of the upper gingivobuccal sulcus (GBS), hard palate, and maxilla seen between February 2009 and 2013 over a span of 4 years. Results: Of the 64 patients studied, 45 were male. The mean age at presentation was 50.59 years (24-80 years). Of the 64, 48 patients (75%) had a history of substance abuse in the form of tobacco chewing, smoking or alcohol. On presentation, 48 of the 64 patients (75%) had T4 disease, eight had T3, six had T2 lesion, one had T1 lesion, and 1 patient had a neck recurrence with distant metastatic disease (Tx). Out of the 64 patients, 31 had clinically palpable neck disease and two patients had distant metastatic disease. Of the 64 patients, 58 had squamous cell carcinoma, two had adenoid cystic carcinoma of the hard palate and one patient each had melanoma, sarcoma, neuroendocrine tumor, and mucoepidermoid carcinoma. Following imaging, 18 patients (28.13%) underwent upfront surgery and six following neoadjuvant chemotherapy. 14 of the 24 patients operated had simultaneous neck dissection. 2 patients with distant metastasis and 1 with cavernous sinus thrombosis received palliative chemotherapy. Out of the 64 patients, the other 24 who were inoperable were referred to radiotherapy. Conclusion: Upper GBS, hard palate and maxilla cancers are uncommon and are diagnosed at an advanced stage due to delay in presentation and ignorance of our population. Surgery offers the best form of treatment. NACT may be tried to downstage the disease in selected patients with borderline operable disease. However, generous margins should be taken post chemotherapy with concomitant neck dissection. Adjuvant radiotherapy is recommended in selected patients after surgery. Introduction: This retrospective study is aimed at the documentation of a more complete view of epidemiological data with particular focus on the characteristics of the surgically and non-surgically treated patients with zygomatic complex fractures. Materials and Methods: A total of 133 surgically and 150 non-surgically patients were treated with zygomatic complex fractures in VU University medical center Amsterdam from January 2007 to January 2012 were analyzed. These patient groups were further subdivided into displaced or non-displaced fractures and compared with each other according to age, gender and trauma etiology. Results: The mean age of all 286 patients was 42.8 years (standard deviation [SD: ±19.8]). Surgically and non-surgically treated patients differed in presentation with a significantly overall higher age of females, especially within the non-surgically treated patient group with displaced fractures (mean age of 59.5 years, SD: ±27.4). The mean ages of males from the different subgroups were more consistent with the overall mean age. The main causes were traffic accidents, whereas the contribution of falls and assaults depended on age group, gender, treatment management and even fracture displacement. Conclusions: This report provides us important epidemiological data of all patients with zygomatic complex fractures. The non-surgically treated patient group contained patients of higher age, more females and a fall-related cause, compared to the surgically treated patient group. The surgically treated patient group showed the same epidemiological characteristics as were demonstrated in previous studies. Introduction: Tobacco exposure is a known risk factor for oral cancer. India is home to oral cancer epidemic chiefly due to the prevalent use of both smoke and smokeless tobacco. To reduce the related morbidity early detection is required. The key to this is detailing molecular events during early precancer stage. 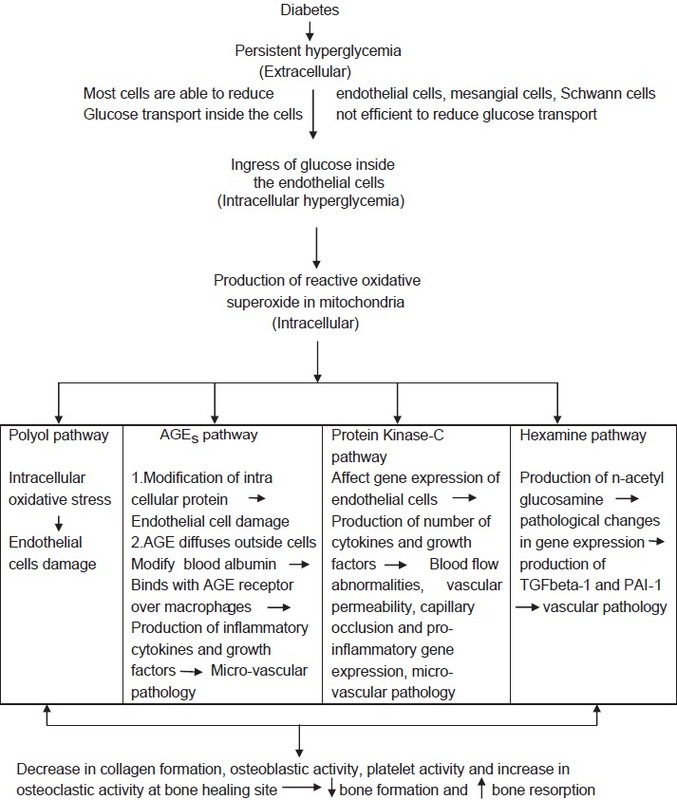 Mitochondrion is an important cellular organelle involved in cell metabolism and apoptosis. Mitochondrial dysfunction is thought to be the key event in oncogenesis. Last decade has seen a spurt of reports implicating mitochondrial mutations in oral carcinogenesis. However, there are few reports that study mitochondrial deoxyribonucleic acid (mtDNA) changes in oral precancer. This study aims to understand and link effect of tobacco exposure on mtDNA in oral precancer cases. Subjects and Methods: A total of 100 oral precancer cases of which 50 oral leukoplakia and 50 oral submucous fibrosis were recruited in the study and a detailed questionnaire were filled about the tobacco habits. Their tissue and blood samples were collected. Total genomic DNA was isolated from both sources. Mitochondrial C-tract was amplified and bidirectional sequencing was carried out. Mutations were scored over matched blood DNA. Results: There was a significant association between the presence of mitochondrial C-tract alteration and duration of tobacco exposure. The probability increased with increasing duration of tobacco consumption. The risk of having this alteration was more in chewers than in smokers. Conclusions: Tobacco in both form, chewable and smoke, is oncogenic and causes early changes in mitochondrial genome and chances increases with increasing duration of tobacco consumption. Aim: The purpose of this study was to determine and compare various postoperative parameters like ease of operability, plate adaptability, stability etc., associated with use of matrix miniplate versus locking miniplate in the treatment of displaced mandibular angle fractures. 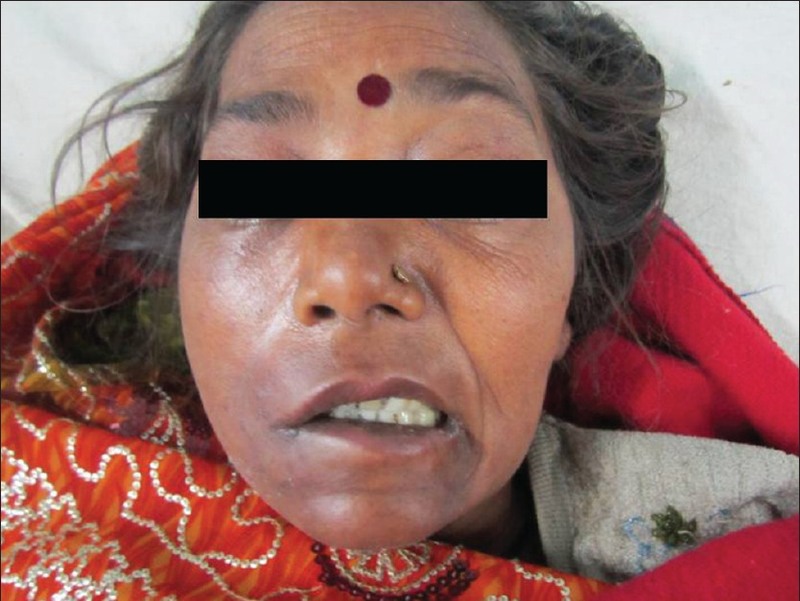 Materials and Methods: The study was carried out in the Department of Oral and Maxillofacial surgery, King George's Medical College, GM and Associated Hospital, Lucknow. Total 50 patients were treated and included in the study. These were divided into two groups of 25 each and were treated with two of the standard techniques, i.e., one is matrix miniplate osteosynthesis and other is locking miniplate osteosynthesis. These patients were evaluated for postoperative complications and the differences between the two Groups were assessed. Results: Patients treated by matrix miniplate showed better recovery phase postoperatively as compared to locking miniplate group. Conclusion: Based on this study matrix mini plate osteosynthesis may be considered as the better alternative method available for the treatment of displaced mandibular angle fractures. 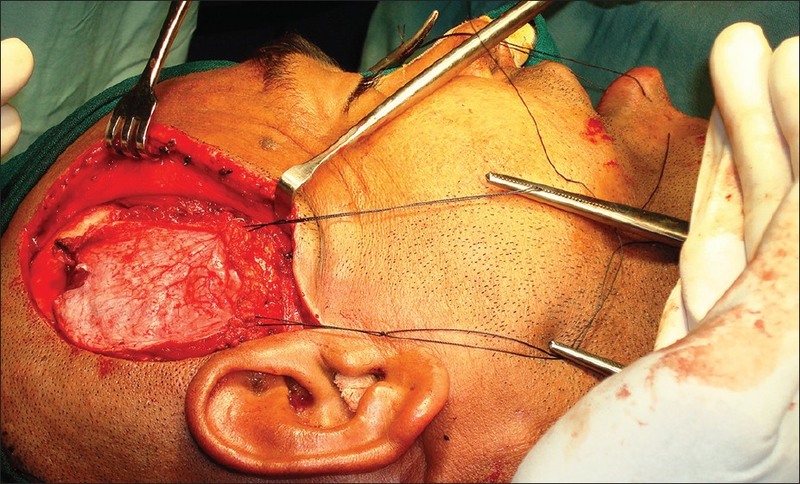 Among plethora of options, the temporalis myofascial flap remains a workhorse for the maxillofacial reconstruction. The inherent advantages include reliable vascularity, adequate size, and proximity to the defect. Although contemporary surgical techniques provide fair surgical results with low rate of complications, their intraoral transposition involve additional surgical trauma by intentional fracturing of the zygomatic arch. We have proposed herein a simpler technique of temporalis myofascial flap transposition into the oral cavity without zygomatic arch osteotomy. Unicystic ameloblastoma rarely seen in first decade of life. This tumour usually appears very similar to a non-neoplastic odontogenic cyst and is frequently clinically misdiagnosed as dentigerous cyst. The distinction from dentigerous cyst is important as unicystic ameloblastoma (UA) unlike dentigerous cyst needs different treatment approach and long term follow-up due to its chances of recurrence. This report highlights the importance of clinical examination in the diagnosis and management of UA in a 5 year old boy. 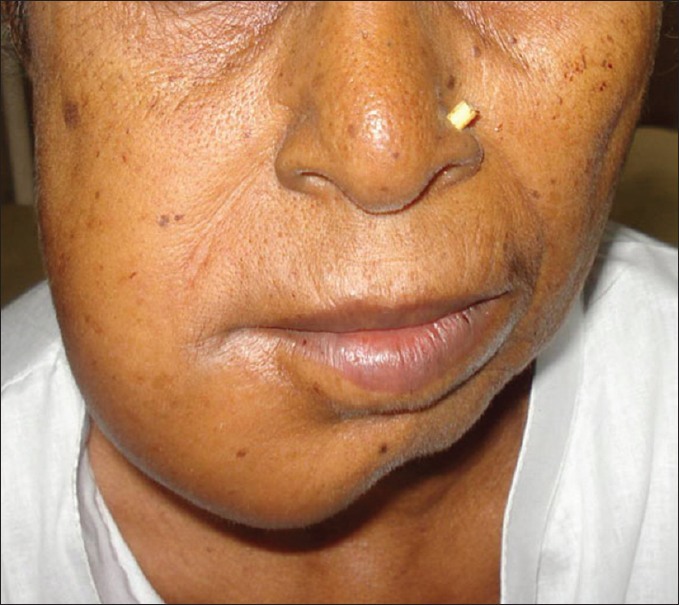 Malignant myoepithelioma is an extremely rare tumor of the salivary glands. Myoepitheliomas make up less than 1% of all salivary gland tumors. 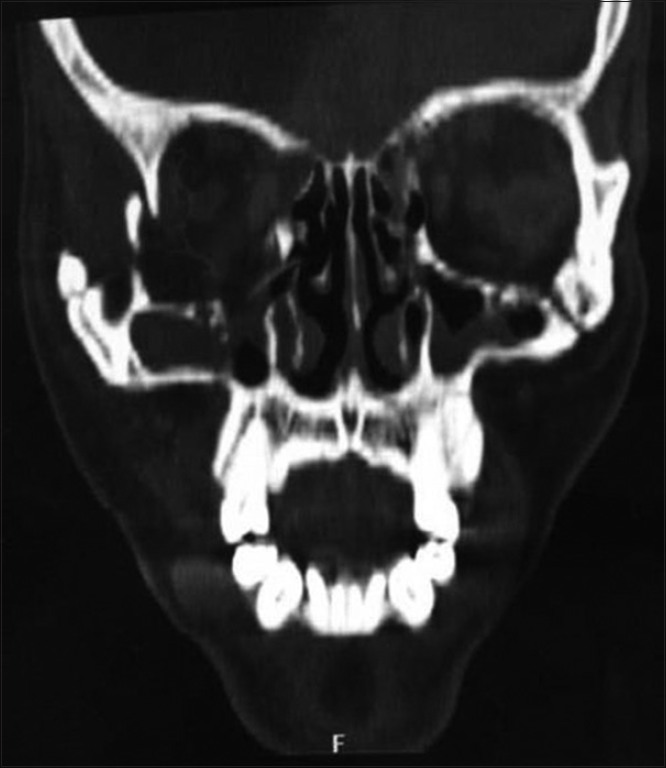 We report of a case of malignant myoepithelioma of the upper jaw in a 55-year old man. The tumor primarily arose from the maxillary sinus and secondarily involved the palate. A diagnosis of pleomorphic adenoma was interpreted, following fine needle aspiration cytology and spindle cell tumor, following incision biopsy with a dilemma. The surgery consisted of subtotal maxillectomy preserving the infra orbital rim and posterior wall of the maxillary sinus, with wide local resection. Neck dissection was not carried out. The final histologic diagnosis of the tumor proper was made out to be malignant myoepithelioma. Three different diagnoses were made in dilemma to reach out the final diagnosis, which was confirmed by immunohistochemistry. The case presented and discussed, underscores the importance of diagnosis and treatment of this rare clinicopathologic entity. Synovial sarcoma (SS) of the arising head and neck region is rare. The most common site being the hypopharynx. 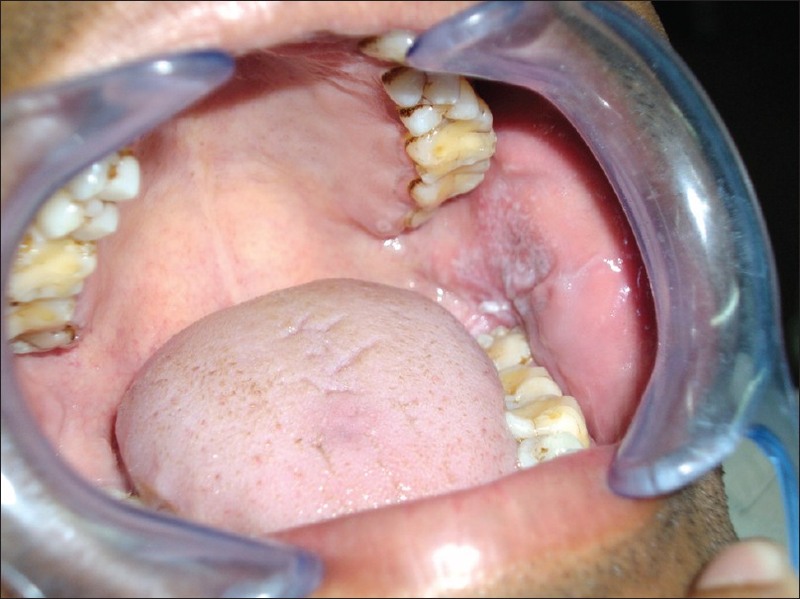 No case of SS from the sublingual of 35-year old salivary gland has been reported. 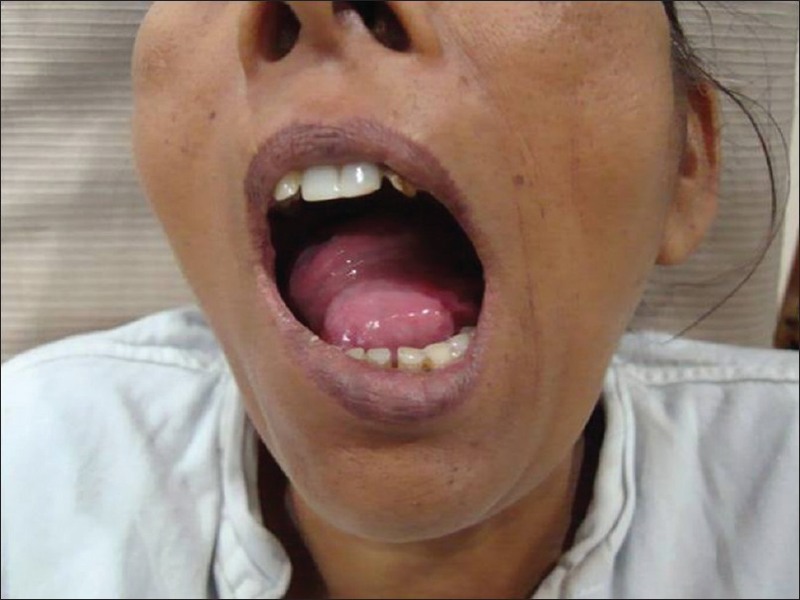 We report a case of monophasic SS in sublingual gland a female making it the first documented case of English Language literature. Chondrosarcomas are the malignant cartilaginous neoplasms rarely seen in the head and neck region. The chondrosarcomas may show an aggressive course and are mostly located in relation with anterior maxilla and base of the skull. Chondrosarcomas of the body of mandible are infrequent. We report a case of low-grade chondrosarcoma of body of mandible, which was treated with a simple excision without neck dissection. Odontogenic cysts comprise a diverse group of exceptional lesions derived from epithelial elements of the tooth-forming apparatus. Calcifying cystic odontogenic tumor is a rare odontogenic lesion, which represents about 2% of all odontogenic tumors and cysts. It may occur in a central (intraosseous) or peripheral (extraosseous calcifying cystic odontogenic tumor [ECCOT]) location. ECCOT in contrast to central, tends to affect the older patients, commonly located in the anterior lower jaw, is less aggressive and the recurrence is rare. Here, we report clinico-pathological and radiographic features of ECCOT located in relation to 48 (posterior lower jaw) measuring about 1 cm in the greatest diameter in a 17-year-old male. Mucormycosis is an opportunistic fulminant fungal infection caused by zygomycetes. This fungus can cause a variety of infections in human beings, particularly in the uncontrolled diabetes mellitus. Zygomycetes impinge into the vascular network, resulting in thrombosis and necrosis of the surrounding hard and soft tissues. 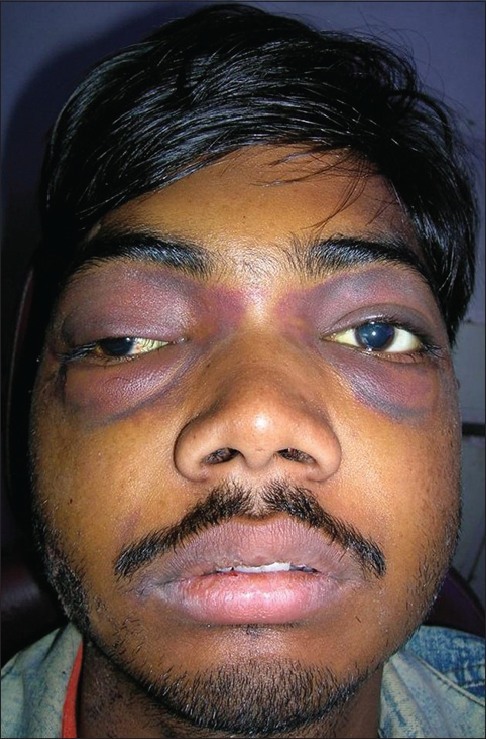 The infection begins in the nose and paranasal sinuses due to inhalation of fungal spores and spread to orbital and intracranial structures either by direct invasion or through the blood vessels. Sinus mucormycosis is often accompanied by a poor prognosis and a high mortality rate. Hence, aggressive surgical intervention with antifungal therapy is usually necessary. Early diagnosis and prompt treatment can reduce the mortality and morbidity of this lethal fungal infection. We report a case of aggressive rhino-cerebral mucormycosis in a 58-year-old female patient with uncontrolled diabetes mellitus. Septic cavernous sinus thrombosis (CST) related to dental infection is a rare clinical event. The septic CST is a disease of high morbidity and mortality. The prompt diagnosis and timely treatment of septic CST is cornerstone of successful outcome. The dental infection should be given due attention, as to prevent CST. In this case report of immunocompetent female, we highlighted the role of dental abscess in producing bilateral CST and facial palsy. The close collaboration between dentist and neurologist and early institution of antibiotics led to complete recovery at follow-up after 3 months. The dental infection should never be neglected as it is the interface of serious intracranial complication like CST. The temporomandibular joint (TMJ) is considered as one of the complex joints of the human body. 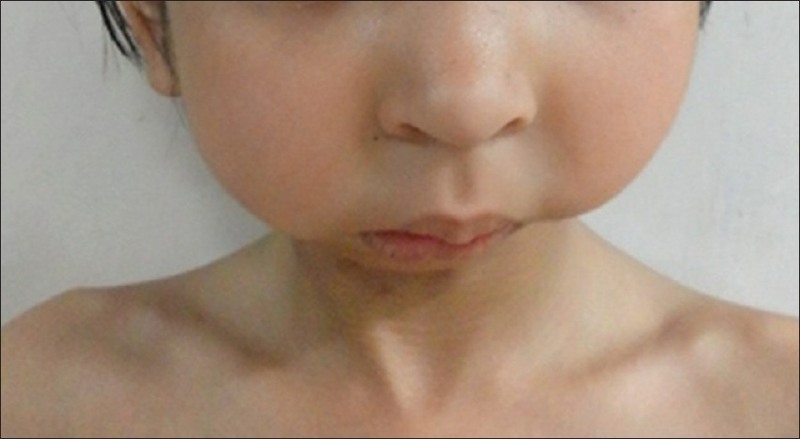 Mandibular condylysis is distinguished from condylar aplasia by its non-association with aural/facial anomalies, and also as normal development appears to proceed until the lytic event occurs. 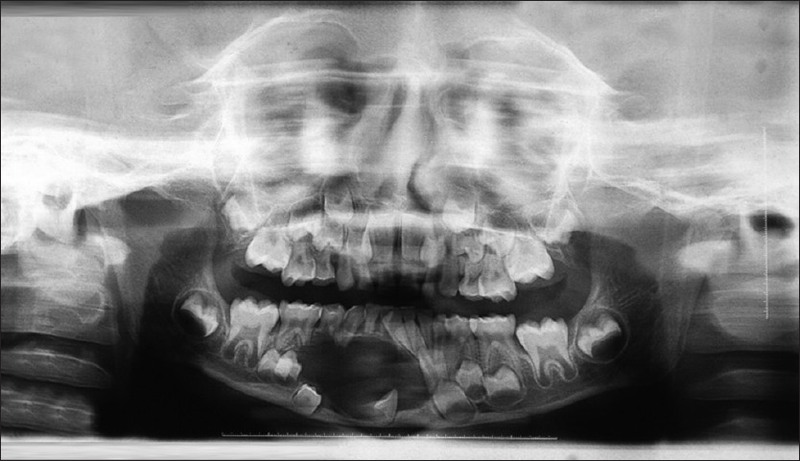 It is further distinguished from primary and secondary condylar hypoplasia by the following: Absence of condyle rather than it being small, the normal development appears to proceed until the lytic event occurs, and its non-association with aural/facial anomalies or temporomandibular ankylosis. 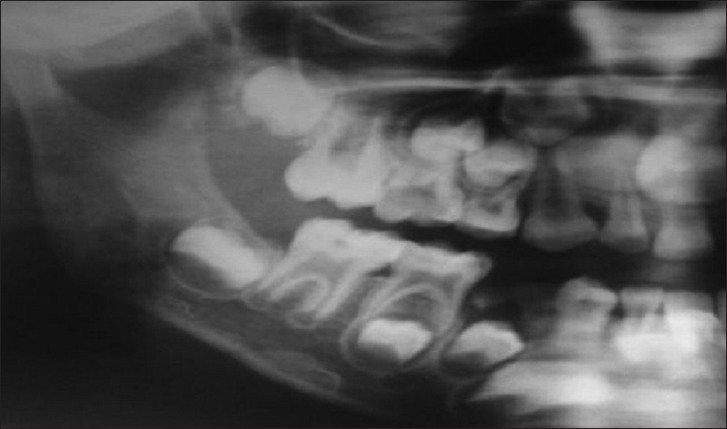 In the present report, a patient with a unilateral missing mandibular condyle with contralateral TMJ ankylosis is presented and the treatment is outlined and discussed.